In the 3rd row, these two seats are identical and are used for the occasional carrying of additional passengers. They can be placed in the table position, folded or removed to obtain a variety of loading configurations. Place the head restraint in the low position. Pull the strap A , located at the rear left of the seat. 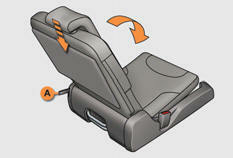 Fold the seat back onto the seat cushion. raise the seat and secure it to the head restraint rod of the 2nd row seat, using the integrated retaining strap C .
put the anchorage covers back in place to obtain a fl at boot floor. 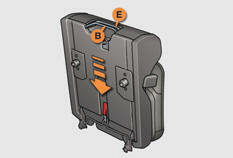 Never use the adjustment and retaining straps to remove, install or carry a seat; use the carrying handle E provided for this purpose (weight of the seat: approximately 15 kg). First remove the anchorage covers on the floor. 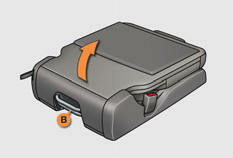 Carry the seat using the carrying handle E .
Put the seat's front feet in place in the corresponding anchorages. Raise the bar B to check that the rear feet are released. the front and rear feet lock automatically.